Using diagonals or “armatures” became very important to me about 12 years ago. I found it was like taking coat hangers and finding ways to carefully hang the “coats of my designs” on them. 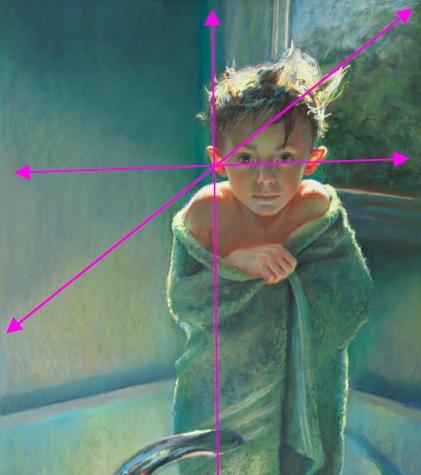 Since I have been talking about the use of diagonals to enhance a painting, I thought this week I would take one of my favorite paintings of my son and show the thinking behind it and how it was constructed. You may see this painting in a whole new light once you see the planning behind it, and where the diagonals are helping me out compositionally. I can’t get into the entire explanation of how it works, but just know that the intersects of these diagonals give me “good math” for divisions of the image. Just like music is composed of chords based on math of 3rds, fourths and 5ths, so too dividing up the canvas this way can give good “harmonic” spots to an image creating harmony in the relationship of objects to each other. This also serves to put his eyes are on the 4th division of the painting horizontally; with the right eye on the 4th division of the painting vertically. In other words, if you divide the painting into 3rds and fourths, these are important horizontal and vertical lines as well. 1. Put an actual object along the diagonal – an arm, leg, etc. 2. Put an edge of an object along the diagonal. 3. Make a color and/or value change along the diagonal. So in this intersection of his ear below, the painting changes along these lines. See how his tuft of hair falls along the edge? Yup. Planned. (Use #2) I had many photo references for his hair and many times when he posed for me where his hair was tousled very differently. I made that tuft important and act as a “directional” to the ear. Notice too how that crazy wet lock of hair goes across his forehead and follows the diagonal as well acting as a link between the left ear and his tuft of hair. This directional below gave me a good place for the faucet to stop, and a color change in the window. 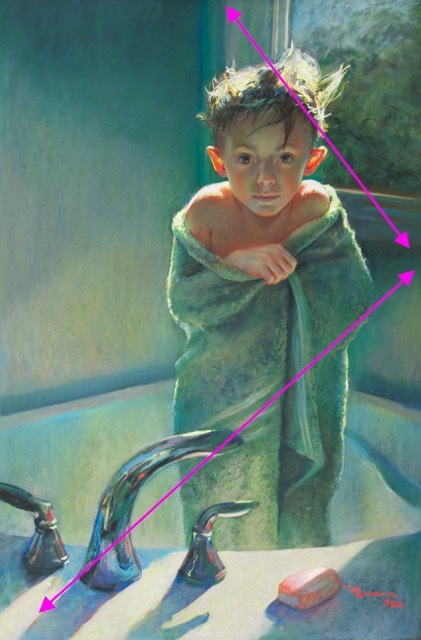 Notice below that the edge of the faucet shadow, the lines on the towel and the edge of his elbow up to the color change in the wall below the window all follow the bottom diagonal. The light and dark areas of his head follow a diagonal, meeting at the same point with the other diagonal on the wall on the right. The edge of the soap; the crease in the towel; his right eye; the darkest lock of hair pointing to his eye and the edge of the window. Yup. All planned. To me this kind of “locked in” placement feels visually correct. And yup! It takes me a long time to plan out paintings. 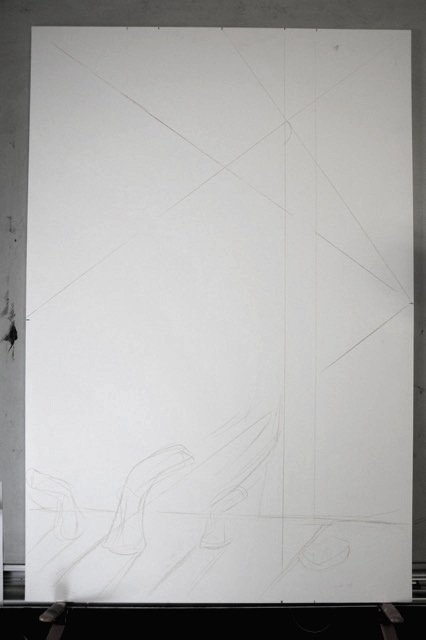 I have gotten faster at it, and sometimes I don’t feel the need to include so many diagonals. Many great and masterful artists don’t use planning of this kind and they are just fine the way they are, so don’t feel the need to design your images like this. But this system has given me a lot of control and helps me answer that age-old question, “is this a good composition?” Because, let’s face it, many times over the years I would ask an instructor… “How can you know you are designing a good composition?” And the answer I would get is that you just have to feel it. I always found that unsatisfactory. This just works for me. But, if designing like this piques your interest, I suggest finding one thing in your design that you want as your main focus and use just one or 2 diagonals to support that area. Trust me, this will get you started on a great journey to controlling your compositions! You’ve convinced me. You’re a great teacher as well as a great artist. Great explanation, Christine. You make it sound easy. I’ll keep looking for those diagonals. you bet. It comes easier with time. ok, i thought my head hurt with the 3,4,5 chord posts. you are aiming to kill those of us that are match challenged. It sure did! I really appreciate your blog. Keep em’ coming! Thank you so much, so fascinating. Where can I find an explanation of the Pythagorean theorem which is not too complicated to understand? hmmm. there are a few resources but not many that are condensed. Juliette Aristedes does a great job in her book, “Classical Painting Atelier”. Just read chapter 2! You may have to read it a few times like I did until it takes hold…. Thanks for this book suggestion. Chpt. 2 is great. I find it very odd that this is all new information to me despite taking 2 art history classes, art in high school, and many many books and workshops over the last 50 years. Love the painting of your son !! true! I think they need to be teaching this in middle school to kids…they do in Italy…. thanks! SO much to learn!!! Fascinating! Thank you; I will give your suggestion a try as I struggle with what is a ‘good’ composition. me too! this really helps! Very interesting process. All of attention paid to the angles and composition is not something most people would recognize consciously but it obviously is a big part of why your paintings are so engaging to the viewer. Amazing! I am in awe of your work and learn so much from your blogs! Thank you for your generous teaching spirit. Wow! This is amazing! How generous of you to share this! 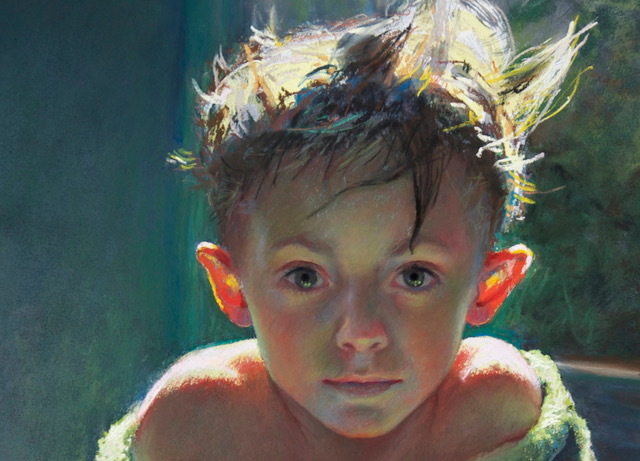 I’m getting ready to start a new portrait, and I’m going to try this, along with your recent tips on color. I really needed some tips to push me to another level. Thank you! Fascinating! Makes my non-mathematical head hurt but my math teacher son would love it!! Thank you for sharing your process each month! One day I’ll learn from you in a workshop! I’m trying to understand this. Your diagonals start in each top corner but go to about a midpoint on each side. They don’t go corner to corner. How did you decide this? HI- some do go corner to corner. Think of the starting points as “anchor points” that start either in the 4 corners or at the 4 midpoints. Then any of those points can create a diagonal between them. When they cross, those intersections are called the “harmonics” or “sweet spots” that divide the image into 3rds, 4ths or 5ths vertically and horizontally. No measuring needed, just where they cross make it a great place to place an important element of the composition. Try the book by Juliette Aristedes, “The Classical Atelier” Chapter 2. This will give a great explanation and a good place to understand how this system and others have been used over the years. Wow, I loved this painting when I first saw it in one of my art magazines. I loved it even more when you showed your use of the diagonals. I really struggle with composition so this is wonderful of you to share! I found this blog to be so helpful. Thank you.